Heritage Floor-Standing 15 Hi Fi Loudspeaker Based on Famous HPD Design. Heritage 2 way floor-standing loudspeaker based on famous HPD design for large rooms. Original cabinet design and components provide a genuine reproduction of the break-though product. Dual Concentric driver based on the famous HPD 1974 pedigree technology provides class-leading coherence and point-source imaging. Sophisticated crossover network with 2 separate channels perfectly complements the Dual Concentric driver for a truly natural sound. Front mounted control panel houses a 2 band energy control with boost and attenuation compensation for room design and tailoring to personal preference. Wide frequency range with excellent transient response results in natural reproduction and an almost total lack of colouration. Heavy duty 24 carat multi-layer gold plated TANNOY customized binding posts for optimum signal transmission and integrity. 8 mm floor coupling spikes provide stability and dissipate unwanted energy. Fifth binding post provides grounding to reduce radio frequency interference and improve mid range clarity. High density cabinet provides extreme rigidity to control low frequency performance. Extensive bracing incorporating DMT (Differential Materials Technology) to couple drivers to cabinets. TANNOY - 90 years of British sound heritage and innovation. Designed and manufactured in the U. Music is an art form that needs to be experienced in all its beauty, detail, and nuance without the colouration that can instantly detract from its purest essence. A truly great loudspeaker design enables the speaker system to remove itself from the soundscape and present the music in a manner that envelopes you in the same way as a live performance. In the 1970s TANNOY created a range of monitors that forever changed the way studio engineers and audiophiles alike chose to experience high quality audio. The TANNOY HPD Series quickly became some of the most beloved Hi-Fi loudspeakers of all time. More than just a homage to its predecessor, the Legacy Series ARDEN Floor-Standing 15 Hi Fi Loudspeaker further elevates the TANNOY HPD heritage of outstandingly transparent performance with the implementation of new, upscaled drivers and components technology that was unavailable at the time. Simply put, ARDEN delivers legendary HPD performance to a new generation of music aficionados. Every design element crucial to ARDENs breathtaking dynamic range, clarity of sound and classic look has been faithfully preserved. Much more than just a clone of the original, this new version of the classic benefits greatly from the evolution of driver and electronic component technology. In keeping with the TANNOY mode of excellence, each ARDEN loudspeaker cabinet is completely handcrafted by our highly skilled team at our Coatbridge, Scotland workshop. Studio Quality Audio In Your Home. The Dual Concentric driver used in ARDEN provides class-leading coherence and point-source imaging for that highly sought after truly natural sound. ARDENs 600-Watt 15 dual driver delivers breathtaking dynamics, powerful transient response and unparalleled realism across a wide frequency range with an almost total lack of colouration. Many of the worlds greatest hits have been recorded and mixed using TANNOY studio monitors, and listening to these speakers is like having the artist right there in your living room. Breathtaking yesterday; equally breathtaking today.. Outstanding Components are just the Starting Point. It takes a lot more than quality materials and hand-selected drivers to build a great loudspeaker; it takes engineering experience with a deep understanding of acoustics, dedicated craftsmanship, inspiration, and a healthy dose of imagination. For example, the crossover network employed in the ARDEN features 2 independent channels that have been skillfully designed to bring out the best of the separate LF and HF sections of the Dual Concentric driver ensuring a truly natural sound. Since loudspeakers actually perform their work in your living space, instead of an anechoic chamber, a front mounted 2 band energy control panel allows you to selectively boost or cut the high frequencies to fit your room or personal taste. ARDEN also has heavy duty 24 carat multi-layer gold plated TANNOY customized binding posts to provide optimal signal transmission and integrity, plus a fifth binding post to reduce RF interference and improved mid range clarity. The enclosure is made following the original ARDEN design, but benefits from new high density materials that werent available back in the 1970s. The resulting cabinet provides extreme rigidity to control low frequency performance, and boasts extensive bracing incorporating DMT (Differential Materials Technology) for proper driver coupling. The base of the enclosure features 8 mm coupling spikes that provide added stability, and help to dissipate unwanted energy that might otherwise detract from ARDENs pristine performance. TANNOYs long and storied legacy lives on in the new ARDEN Floor-Standing 15 Hi Fi Loudspeaker; a legacy that has endured the test of time and adapted with the evolution of technology. Whilst the bass is quite deep for the size of the ARDEN enclosure relative to the driver size, the speed and leading impulse is exciting and rewarding. Vocals are a little forward, as with many monitoring speakers, allowing the nuances of the voices to be fully appreciated. The smooth transitions to the HF device and the high sensitivity of the horn loaded dual concentric provide amazing clarity with dynamic transient response. Every ARDEN includes an owners care package as well as a Birth Certificate heralding its authenticity. ARDEN simply has to be experienced..
38 Hz - 30 kHz ±6 dB. 150 W continuous, 600 W peak. 1 x 15 (380 mm) Paper pulp cone with twin roll impregnated fabric surround. 52mm (2) edge wound voice coil. 1 x 1.3 (33 mm) aluminium/magnesium alloy dome with edge-wound voice coil. Bi-wired, hard wired passive, low loss 2nd order low pass, 1st order high pass. ±3 dB over 1 kHz to 30 kHz shelving, 2 dB to -6 dB per octave over 5 kHz to 30 kHz slope. 5 x 4 mm 24ct WBT binding posts. Dimensions (H x W x D). 910 x 602 x 362 mm (35.8 x 23.7 x 14.3). 41 kg (90.2 lbs). 19 mm (3/4) MDF with plywood internal bracing - heavily damped. Walnut veneer and high acoustic transparency nylon grill cover. 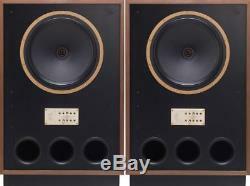 The item "PAIR FLOOR STANDING SPEAKERS TANNOY LEGACY ARDEN BRAND NEW! WARRANTY" is in sale since Monday, January 7, 2019. This item is in the category "Sound & Vision\Home Audio & HiFi Separates\Speakers & Subwoofers". The seller is "hifiexperience" and is located in F - D - GB - I - NL DETAILS IN SHIPPING.